Have you ever had a week when things went so ridiculously well you started to suspect someone might be playing a trick on you? A week when you were waiting for one of your friends to jump out from behind a bush and tell you it was all a joke? I had one of those weeks just before Christmas. Of course I told everyone I knew, and then a few people I didn’t. An award nomination for my first book! Things don’t get more exciting than that. Except they did . . . I broke the sofa, and I’ve been floating on a cloud of celebration cake ever since. I have to confess I half-hoped Redbridge, Leeds and Worcestershire would forget to announce their award results. The other books were so good I was sure I wouldn’t win, but while the judging was going on I could still pretend it was a possibility. So I had mixed feelings when I got the invitation to the Worcestershire Awesomest Book Awards on the 25th March – until I noticed the entertainment for the event was John Dougherty, the funniest (and nicest) guitar-playing author in the world. 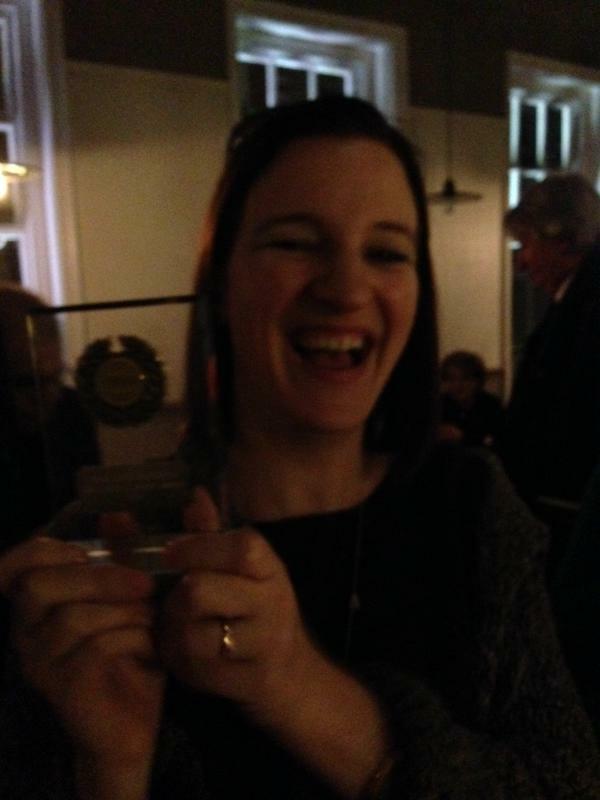 There aren’t many people I’d rather not-win an award with, so I prepared my ‘happy loser’ face and set off. I loved the event from the moment I arrived. The organisers from the Worcestershire Schools and Library Service were welcoming and knowledgeable – if I were a library I’d want to be built in Worcestershire. The kids were bright and enthusiastic and they stormed the questions in The Case of the Exploding Loo section of their book quiz (congratulations to the winners from Powick Primary School, who beat Broad Heath Primary School in a tie-breaker). Then it was time to fix my ‘Not-Disappointed-At-All’ face for the announcement of the 2015 Awesomest Book Award winner. I don’t think any Oscar winner can have been any more thrilled that I was when I heard my name. I’m not sure how you measure ‘success’ as a writer – I’d be interested to know what anyone else thinks. For me, it’s not about money (fortunately) or fame (equally fortunately, although I was once recognised in the vegetable aisle of the local supermarket). Until yesterday, I’d have said that it wasn’t about awards either (probably because I never expected to win any). But there was something lovely about the fact these kids and librarians liked my book enough to have voted for it, and I had to keep my thank you speech short to avoid coming over all Halle Berry on them. Plus, I can’t deny it was nice to see my name printed just below David Walliams’ on the winners’ shield. Now all that remains is for me to find out how long it’s socially acceptable for you to keep an award in your handbag. Congratulations, and so delighted to hear that you love Worcestershire!!! As I school librarian in Worcester I am inclined to agree with you, though I may be a little biased! I will pass this on to the SLS, so she can share it with all the other schools involved. Thank you so much! Thanks, Laura. It’s safe to say I’m a bit chuffed!